In the 1st quarter of 2018, a whopping business of $2.33 trillion was generated by the manufacturing sector in the US economy. The industry pundits have also predicted that the value of manufacturing sector will surpass figures from any the years in past. It won’t be wrong if online Business to Business model is held responsible for such a tremendous growth. WeblinkIndia.net is one of the prestigious names for getting ultimate B2B portal development solutions from India. WeblinkIndia.Net specializes in undertaking B2B Portal Development for all types of small to medium and large scale business entities. We design and develop B2B Portals that provide platforms to many business directories as well as industry-specific portals depending on the required model. With WeblinkIndia, all the customers get unmatched and original B2B Portal Development solutions and that too on the most economical rates. We have qualified and experienced B2B Portal Development experts who create B2B Directories exactly as per the specific demands of the clients and the requirement of end-users. As a top-notch B2B Portal Development Company, we are successfully managing several B2B Portals that provide the best E-Commerce solutions to a large number of businesses across the globe. Exportersindia is among the largest B2B Portals and Exporters Directory. 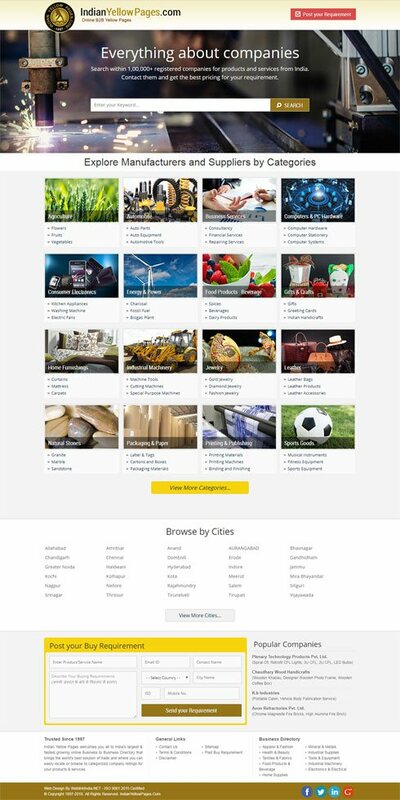 It connects Manufacturers, Exporters, Suppliers and Buyers at a common platform. The portal is world-renowned for being a source of only genuine business enquiries and supplementing the best trade deals between exporters, suppliers, importers and buyers from every part of the globe. This Online B2B portal is handled by WeblinkIndia.Net, which is functional from more than 17 years. WeblinkIndia.Net specializes in PHP Web Development, Static Web Designing and Linux Hosting. We deal in different types of industries such as apparel & fashion, education, agriculture, chemical, Ayurvedic & herbal, construction machinery, building material, consumer electronics, environment, energy & power, office supplies & stationery, industrial supplies, and various others. We also provide a live chat service and paid memberships to our clients. The official website of our company is developed and managed by an India-based company named WeblinkIndia.Net Pvt. Ltd. Choose WeblinkIndia For B2B Portal Development – Here’s Why?